A prolific master of religious and historical works, as well as portraits, Tintoretto developed a rapid, often impetuous manner of painting that was both expressive and expedient. Here he captures the dignity, prudence, and calm equanimity befitting “the most serene prince” of the Venetian Republic. In 1567, the eighty-five-year old Pietro Loredan (1482–1570) had been elected doge by his fellow councillors to break a deadlock. 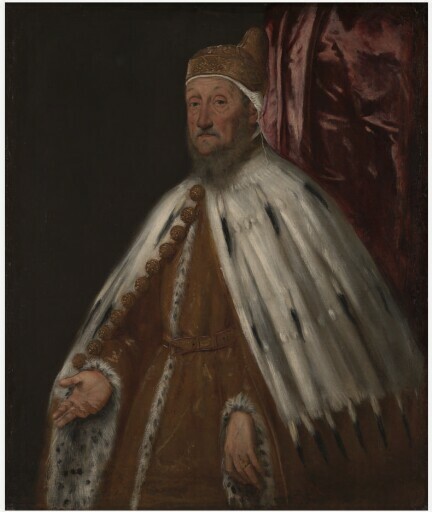 Tintoretto portrays him in his ceremonial dress: the gold brocade, fur-trimmed robe; the ermine cape with golden harness-bell buttons; and the distinctive corno dogale (doge’s hat) worn over a white linen cap. During his brief three-year reign, Loredan presided over famine, pestilence, a great fire at the Arsenal, and the onset of war with the Turks over the possession of Cyprus. Tintoretto shows his subject ruddy-faced and world-weary, giving physical expression to the weight of his obligations, as well as tempering the formality of an official portrait. Tintoretto’s technical facility is evident especially in the vigorously modeled face and the swift, sure strokes of the cape. This proficient style recommended Tintoretto to the Republic’s officials, who typically commissioned portraits upon their election. Another version of this portrait, now in the National Gallery of Victoria, Melbourne, may be the first version, painted from life, from which was derived the official portrait displayed in the Doge’s Palace and destroyed in a disastrous fire in 1577. The version in the Kimbell is possibly the painting that belonged to the Loredan family, mentioned in the will of the doge’s son Alvise. estate of John Ross Delafield, New York.